I worked at Celestica in Toronto from 2000-2004. Celestica was a difficult place for me to work. I had the predisposition and desire to be a leader, but not the skills of a manager. I had the talent of an analyst, but not the experience of working in an office. Since then I have developed my skills and garnered more experience. I am a much better employee and manager today and I also know that Celestica was not the right fit for me to do my best work. Celestica has a share purchase plan as part of their benefit package. This was my first experience owning shares and it was pretty darn exciting. You must remember this was at the height of the tech market boom, and we were used to seeing our shares increase by 10% in a week. With the company matching, the value of those shares were exceptional. They split a couple of times, and it was always fun to argue with co-workers on what results were coming. Despite the success of Celestica shares, I wanted to avoid being over leveraged and therefore only held them in my investments. (who am I kidding, they were my only investment) I decided to hold other stocks within my RRSPs – self-directed of course. How hard could it be investing your own money? I was young, and all of the charts told me to have higher risk in my RRSP portfolio. I took that to heart. Yep, over the years, I have purchased a labour sponsored fund, small cap tech funds, threw in some overseas funds, and mostly any new money in my RRSPs invested in stocks. Generally, I looked at the Highest Volume charts for the day and picked companies that seemed interesting. When I worked at Celestica, I worked for two different Customer Focused Teams (CFT). One was Lucent (where I started) and one was Cummins (where I ended). I liked the Cummins team and liked working with their company. So, I scraped together enough money in my RRSPs to purchase some of Cummins shares. I purchased 25 shares at something like $66. This was some big spending for me back in 2003/2004. I received modest returns for the first couple of years – enough to feel successful about it. Considering the shape of my other investments after the tech bubble burst. Sigh. I sold off some other items nd purchased another 10 or so shares of Cummins. In 2007, Cummins did TWO 2-for-1 stock splits and they started paying dividends. This increased my holdings to 133 shares. Yes, I am a serious Cummins holder now. I probably have to register any sale I make with the FCC. Emile and I have put little into our RRSPs over the last couple of years, instead focusing on paying down our mortgage. So, I don’t really look at my holdings too much, and during 2008/2009, it was pretty darn depressing anyways. Today, Cummins is down $4.70, but OH MY GOD! 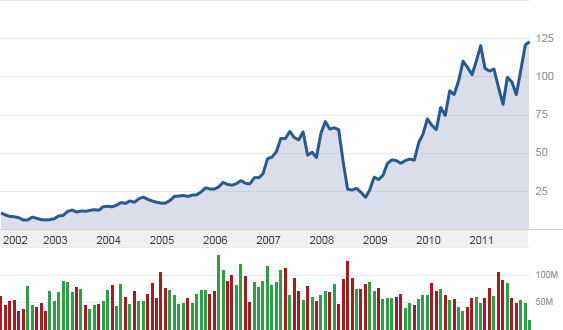 Cummins (CMI) ten year stock price chart (adjusted for splits). Too bad the rest of my risky investments have a similar chart – just upside down. March 20th Extra-Ordinary: 33 shares of Cummins eventually becoming the major holding in my RRSPs.